Lightweight aluminium frame, slowing brakes on the handles and locking brakes by the wheels. Larger than standard 12.5″ rear wheels with puncture proof tyres. Attractive removeable backrest padding and padded armrests. Adjustable height and easily removeable footrests, complete with heel and calf straps. 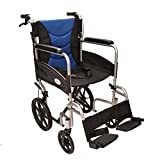 Half folding back mechanism so the handles fold down behind the wheelchair for easy storage and transportation.